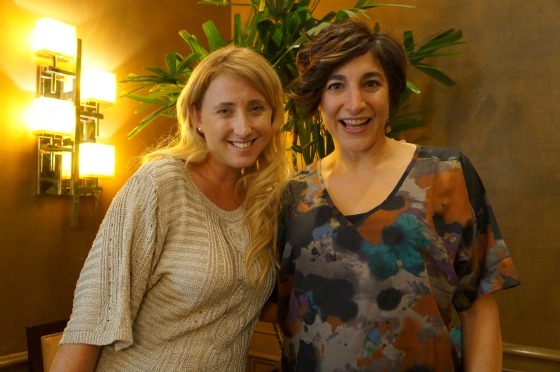 Last week, we got a chance to enjoy lunch with the producer of Brave, Katherine Sarafian. We also had a chance to talk to her about her relationship with the country of Scotland, and how it impacted her role in the film. Was the film always planned to be set in Scotland? The film was always planned to be set in Scotland. The initial nugget of the idea was from Brenda Chapman, one of the directors. She had a six year old daughter, and Brenda was a first time parent with this very feisty daughter. They were just butting heads and disagreeing about things. She started to wonder what kind of teenager her daughter would make? What she would be in for as her daughter becomes a teen. That was the basis of the story that Brenda pitched to John Lasseter and the creative team. Soon after that they told her to develop that relationship, and she quickly put it into a Scottish setting very early on because she was of Scottish ancestry. She had traveled to Scotland and just fell in love. The dramatic changes in landscape, weather, and light in Scotland all overwhelmed her. The power of the land with its many stories, magic, legends, and fairies made Brenda fall in love. What type research went into the film? We think about writing what we know, and our directors really knew Scotland. Everyone else needed to know about it too, so we took our first trip in 2006 trekking through the highlands exploring. We did another research trip in 2007 and we started pouring over everything and putting it into the film. Have you returned to Scotland since the movie has been released? Yes, I was there in the end of June. It was so great to come back to Scotland for the premiere of the movie. One of the highlights for me was after the premiere we drove up to the highlands. We wanted to do a screening in Inverness because the highlands were such an inspiration for the movie. Keeping all our events in the big city did not make any sense since it was a highland story. So we went into Inverness and went into a little theater or community hall they had there, and that is where I fell apart and the tears started streaming. We were done with this odyssey of six years, and we were back in the highlands. Its beautiful weather, people singing lullabies and it made me fall apart. It was overwhelming emotion to go back to the highlands like that. What was the local response to the film? The premiere sold out in just 20 minutes. We had never up until the premiere watched it with a Scottish audience. We had done test screenings in the United States, but we had never shown it to Scots. Not only was the audience appreciative, but they laughed at things that American's did not. In the United States, some of the audience did not understand the jokes, but the Scottish audience could not stop laughing. It was gratifying to have people laugh at everything. It was nice...just really nice. We were so happy to know that we had gotten it right. Did you look at the Country differently when you returned to Scotland after the making of the film? It was reassuring. Noticing the things I had been talking about during the making of the film, are all still there. It is amazing how epic and consistent the Country is. The shapes we saw that have been there for centuries and centuries, are still there. This still felt like the Scotland I remembered. The weather is different today, the colors are different today, the light changes every second, but the shape that we would see in Edinburgh is so characteristic of Scotland. There are shapes that you would not see anywhere else, covered with soft blankets of mosses and grasses. I saw that, and got it from just flying overhead. It is reassuring to see that yes, the movie represents this land. It was moving because it is a very powerful place. I have always believed that your environment helps shape your mood and how you feel. It was something that I always believed, but Scotland really put a finer point in that for me. I got a more in depth understanding of why people are who they are. Brave is now available on DVD and Blu-Ray. Disclosure: We were offering time with the producer during a media luncheon. All our photos, thoughts and opinions are of our own.